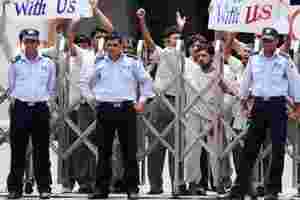 New Delhi: Marathon talks brokered by the Haryana government between the management and striking workers at Maruti Suzuki India’s (MSI) Manesar plant are still on, with the stir entering its 14th day on Thursday. “The tripartite negotiation is still going on since 11 am yesterday," a Maruti Suzuki India (MSI) spokesperson told the news agency. Talks between the MSI management and workers in the presence of Haryana Labour Department officials resumed on Wednesday morning after they broke down on 18 October. “Hopes of an agreement were raised late last night, but an agreement could not be reached as both sides stuck to their stands," a source privy to the talks said. Meanwhile, shares of the company were being quoted 0.045 lower at Rs1,065.10 apiece at 09:25 am on the Bombay Stock Exchange (BSE). In the meantime, the company said it will continue partial production at its Manesar plant with a limited workforce. The company has already resumed operations at the plant with workers who did not join the strike. It claimed that the strength at the plant has gone up to 600 and rolled out 200 cars on Wednesday. MSI chairman R. C. Bhargava on Wednesday said the company was hopeful the impasse would end in the next 4-5 days. “We have been talking to them for the last three days. We keep talking as a solution to these things takes some time. I cannot say when, but only I can hope that the issues will be solved in the next 4-5 days," he said.